Home - Norwich Rugby Football Club Annual Dinner and Special guest! Norwich Rugby Football Club Annual Dinner and Special guest! Norwich Rugby Football club held their annual dinner on Thursday evening at the club house. It was a lovely start to the evening with brilliant sunshine and fortunately no rain, which saw some 300 guests arrive at Beeston Hyrne to share in the team’s achievements and disappointments of the season. The club was honoured to have as its guest speaker Austin Healey, former Leicester, England and British Lions player. The audience was entertained and enthralled by his quick witted stories, impressions of team members and memories of games and trips that had occurred during his playing career. One of the presentations during the evening was to Tom Williams who was selected by his team mates and coaches as the Anglian Home Improvements – Player’s Player of the Year. 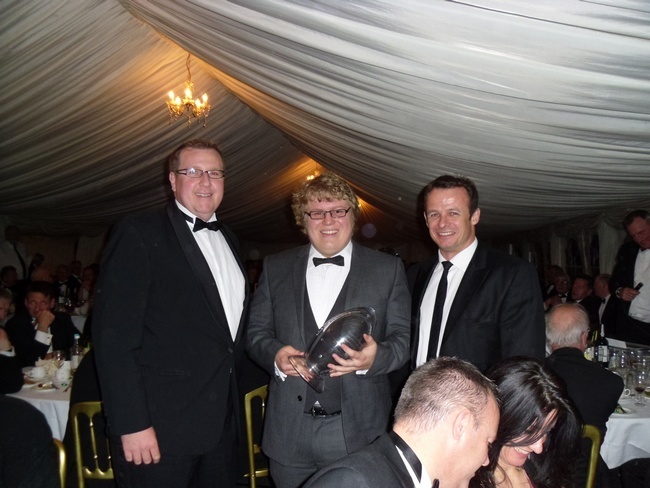 The award was presented by Tony Cronin and Austin Healey. As it is now the end of the season, conversations were already looking forward to the 2012/2013 season and the teams fortunes. We would like to wish them all good luck for next season.